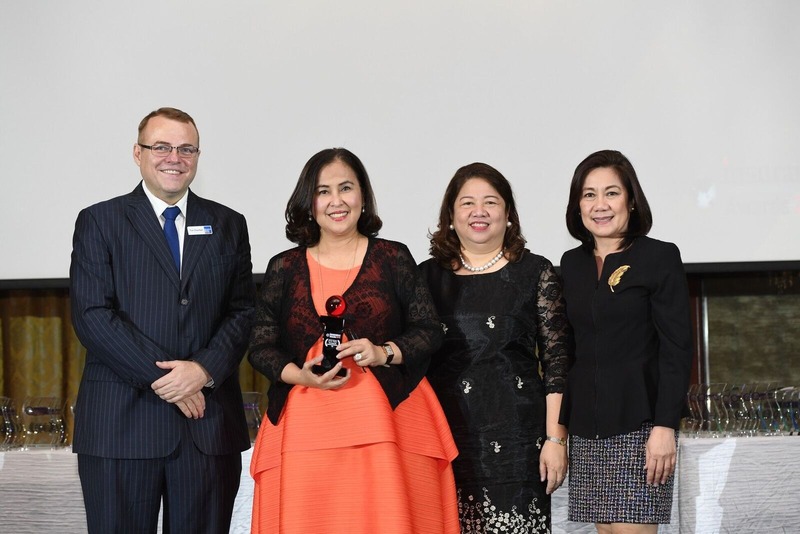 Insular Life Executive Chair Nina D. Aguas (2nd from left) and President and CEO Mona Lisa B. de la Cruz (3rd from left) received the Domestic Life Insurer of the Year Award from Asian Banking & Finance Magazine Editor-in-Chief Tim Charlton. With them is Insular Life Sr. Asst. Vice President and Public Relations Head Ana Maria R. Soriano. Insular Life bagged the award for the Domestic Life Insurer of the Year – Philippines 2018, given by the Insurance Asia Awards. This is the second year that Insular Life was given the award, which honors companies on the basis of the following criteria: uniqueness and a culture of innovation, effectiveness and impact of products and services to their publics and the industry, and dynamism and flexibility to changes and progressive opportunities. Insular Life remains to be the only Filipino life insurance company among the top in the industry, dominated by foreign-owned companies. It occupies the 2nd spot in terms of net worth and 3rd in both net income and assets among 30 life insurance companies in the country. It continues to pioneer in the use of technology for its services and systems. Among these are the following: Robotics Process Automation using the AGILE/SCRUM Methodology, which allows faster deployment of programs to automate repetitive and resource-intensive processes and has resulted to higher efficiency, lower costs, and better user experience; a fully-Automated Underwriting System (AUS) which has reduced the life insurance application process from three to five days to 30 minutes for standard cases; a remote check printing facility that has allowed claimants to get their checks in under an hour for as long as requirements are complete, even when transacting in the Company’s field offices; I-SERVE, Insular Life’s policy servicing facility that now allows policyholders to perform online services on their traditional and Variable-Unit Life policies; an automated tracking system that uses bar codes to improve efficiency in handling documents; and a leads generation system that aids financial advisors to give the best possible advice to potential clients. Insular Life was also recognized for its deep-seated commitment to its policyholders and the public through its social responsibility arm, Insular Foundation, which continues to build school buildings in disaster-stricken areas in the country, and respond to calls for financial and material assistance to underprivileged sectors of the society. Recently, Insular Life forged a partnership with World Bank’s International Finance Corporation to educate and offer risk-mitigating solutions for women to become self-reliant and financially-independent.